We were up early, just before 6:30am, this morning to head out at 7am to catch the 8:05am Amtrak to Philadelphia. You'd think with public transport and it being a Saturday, and hour would've got us there comfortably on time. Turns out it was a mad rush after we got stopped on the tracks at one station and then one of the 3 trains we were supposed to be taking didn't arrive. We headed up from the subway and caught our first (and only) Yellow Taxi from Grand Central to Penn Station instead. And then we joined a massive queue to board our train with a mere 5 mins to spare. Here we thought we'd have time to grab breakfast at the station before we left. No such luck! It was an easy hour & half ride on the Amtrak, with a few stops thru New Jersey. I enjoyed looking out the window, as always.We passed thru some seriously overcast and misty weather, I was getting a little nervous, honestly. About half an hour before we arrived in Philly, The Trucker discovered the food carriage and we each had half a bagel with Philadelphia Cheese for breakfast (how terribly appropriate: Philly eating Philly en route to Philly - wahahahaha) and he had a coffee and I had a Starbucks frappachino. I think we've found my Starbucks "thing". Haha. When we arrived at the 30th Street Station, we bought a One Day Independence Pass for the public transport (yes, I'd researched and planned our route months ago already - haha) and took a quick walk to the Mütter Museum. OMG. I thoroughly enjoyed this, although we only spent an hour there (I'd allocated 2hrs per museum visit today). Which was far less than the 3hrs I spent in the Hunterian Museum. I think I also preferred the Hunterian Museum. I'm not so interested in the instruments honestly. I did like the skull wall. Fascinating how different we all are even underneath our skin. I found the slide of Einstein's brain interesting although I still can't see the difference (apparently some part of his brain was larger than average). Lincoln's death mask was also a bonus. Damn, looking online I realise I missed Jordan Eagle's Blood Work exhibition while there ... actually saw mention of it on Facebook before we went and wanted to see it. But somehow we missed it so it obviously wasn't as readily available / advertised there as the Civil War Exhibition that we did see. But my favourite bits were definitely the Giant Skeleton and then the siamese and deformed sections. For some reason I find these oddities completely fascinating. After I'd finished, we hopped on bus and headed to Pat's King of Steaks, where the Philly Cheesesteak was apparently first created. It is a very speedy experience when ordering. I guess when you have pretty much only one thing on your menu that's so well known, you can do that. We each ordered a cheesesteak with onion. Wow, they are big. And then we got cheese fries to try as well. LOVED the cheese fries! The cheesesteak was exhausting to eat, so much bread and I didn't think there was enough or a strong enough flavour of cheese. As we walked to the next bus stop, we spotted a place called Rita's and decided we needed some dessert. The Trucker just had "twisted custard" in a waffle cone, which was basically a vanilla and chocolate soft serve. After that we were stuffed and hopped on the next bus to Market Station where we caught the Airport Line to Penn Museum. 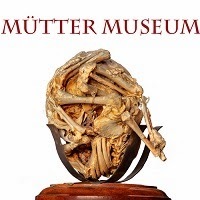 We'd bought a double ticket at the Mütter. This museum was actually pretty disappointing. That said, I really liked the Artifact lab where you could watch people working on restoration for their Egyptian collection. We sped thru the museum and ended up with 2hrs to spare before our Amtrak return to New York. We wanted to walk as little as possible. Damn, my feet are sore. So we headed straight back to the 30th Street Station and found ourselves a bar. We tried a few different beers, unfortunately they didn't have stock of any of the fruit ales that took my fancy but, I tried a Well's Banana Bread Beer, while The Trucker had Yard's Philadelphia Pale Ale. After that we shared a very nice Samuel Smith's Organic Cider. And then it was time to go. We got some snacks for the trip, because I can't resist trying new flavours. I found Cheesy Garlic Bread Lays and an Almond and a Peanut Butter Snickers (okay, The Trucker threw in that last one). 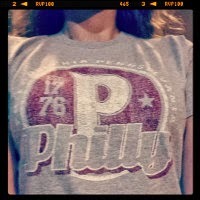 I also found a Philly T-Shirt at one of the Amtrak station store, which I had to have - haha. It's a kiddies shirt, but the large size fits perfectly :) And, I threw in a pack of Twizzlers to try. Twizzlers are a total waste of time with a very strange taste, we had the cherry (I expected it to be stronger). The train ride back to New York was uneventful and we went straight back home to charge everything and get changed before heading out again. We had decided to go up the Empire State Building. We got all the way to the final elevator to find out that there was zero visibility up top because of cloud cover that had rolled in. So, since our tickets are valid for 14 days from purchase, we decided to save them and wait till our overnight in NY on the way home. Such a pity but I didn't want to waste the tickets (at 27USD each) and end up seeing nothing! 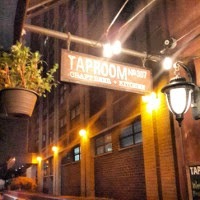 So we headed back down again and tracked down a little pub I'd seen yesterday on our bus ride up 3rd Ave that I thought looked quite cool, called Taproom No. 307. I tried a Blanche de Bruxelles because it sounded like a Bone Crusher (describe on the menu as a Tall Boy can of delicious wit with flavours of Coriander and Orange). The Trucker had a very nice Schofferhofer Grapefruit wheat beer which was quite lovely (and I don't even like grapefruit!). Then, with our second round, we ordered an amazing plate of nachos to share. Yum yum. I had a Liefmans Cuvée-Brut (Belguim ale brewed with tart cherries), which was quite good but quite sweet. The Trucker had an Ommegang Scythe & Sickle, which I didn't really like at all. And then it was straight home to bed, we have another early morning tomorrow! This sounds like a VERY busy day...with lots of new tastes. That almond snickers sounds yummy!